From Grandma's kitchen to my own, Thanksgiving was a success! When I was little one of my favourite holidays was Thanksgiving. We all geared up for a day spent at my granny's house where she prepared a delicious, full, thanksgiving dinner fit for a king! I'm not joking. This woman had a recipe book in her head! I would always ask her where her recipe was like my mom used and she would tell me she kept them in her mind. Unlike her, my memory stinks so I have to use recipes. She always made the best tasting everything from turkey to sides and pies, oh the pies! I remember watching her work. I subconsciously absorbed information that would gladly show up at the right moment years later. I haven't quite mastered the kitchen like my grandma but I've been working on it as the family is growing. Obviously (if you've been following my blog or social media for any time) I can do basic everyday meals but bigger feasts, I need more practice. I've done a few roasts, chicken and things over the years but I hadn't dared try a turkey on my own. Someone (usually family that doesn't live here) always helps by either cooking it and bringing it over or taking care of things in the kitchen for me while here. I guess it's the polite way to say "I don't trust your cooking" - I'm joking. At first I hadn't been planning a big dinner because we have been sick on and off, I didn't know if I would be up to the task so I couldn't make any promises. A few days ago I started feeling better so Hubby went out and bought everything I needed, including the turkey for a feast fit for a family of five and some. I checked out simple (and delicious looking) recipes online and found one I could handle. Prepare a turkey in a house full of hungry kids and you have yourself a game of 20 questions. The boy wanted to know where the other parts were (head, feet etc) and my daughter was asking what they do with those parts her brother was asking the whereabouts of. A simple "you don't need to know, lets get cooking!" changed their minds. Let's save that conversation for another day. 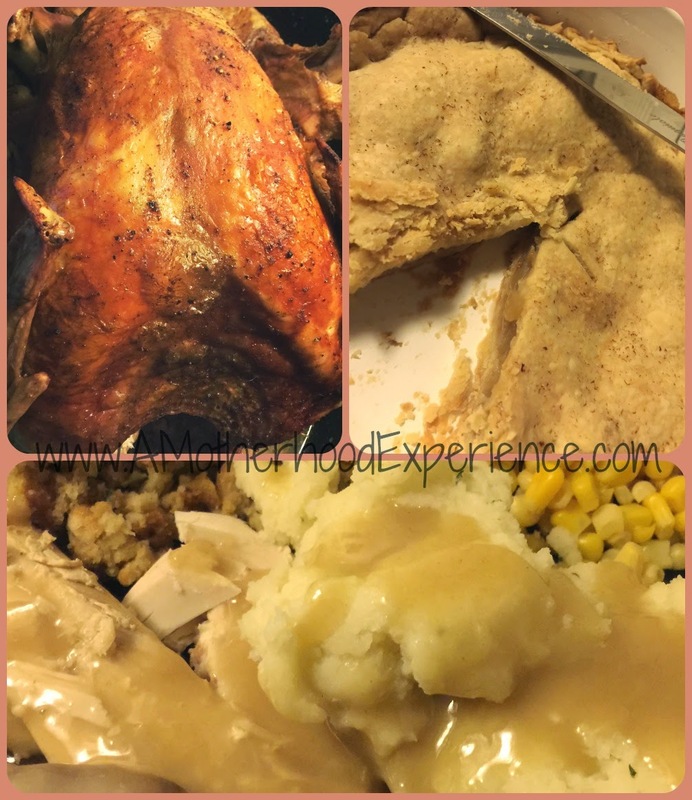 While the bird was cooking my oldest told me she was disappointed there was no apple pie to go with the turkey dinner (as I hadn't planned to cook a big dinner and honestly forgot about desert!). Mom guilt kicked in so I peeked into my cupboard and came up with enough ingredients to make an apple pie. I'm proud to say I didn't use a recipe for anything but the pie crust for that one and it turned out really yummy! Next time I'll have to make a bigger pie though, work with what we have right! As I was preparing the pie, it was like all the memories of my grandma's kitchen on Thanksgiving flooded back for a moment. This dinner was also for her. Four hours in the oven and we had ourselves Thanksgiving perfection! It looked good, it smelled Divine and it tasted heavenly! I am proud (and relieved) everything turned out great. I learned from two generations of the best. We ate and we gave thanks. Posted by AME. Pictures by AME. Opinions and comments on this blog are those of the author.